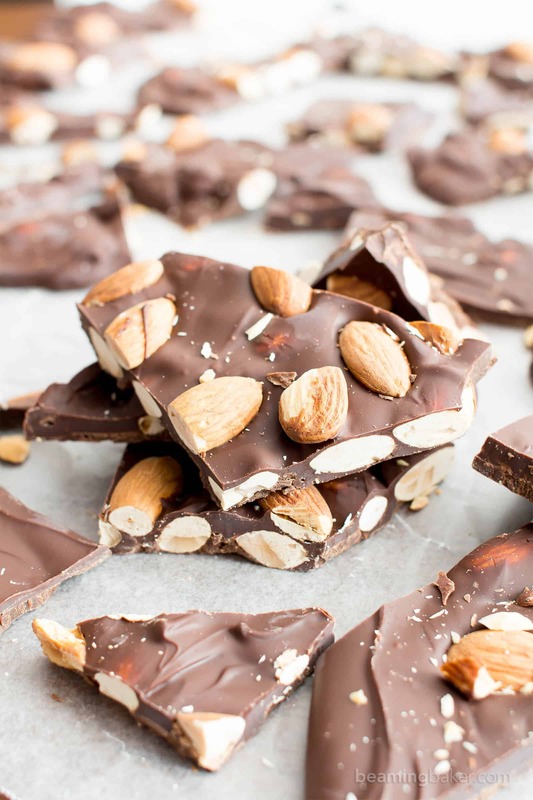 3 Ingredient Chocolate Almond Bark Recipe (V, GF): an easy recipe for thick pieces of indulgent chocolate bark packed with crunchy, roasted almonds. Vegan, Paleo, Gluten-Free, Dairy-Free. Chocolate in the morning, chocolate in the evening, chocolate all of the time!!! Can you just hear that song twinkling through your eardrums as you dream of chocolate-covered streets, a la The Simpsons? There’s just these glorious wafts of melted chocolate essence floating deliciously through the air right now. And this time I know I’m not just dreaming it! (As was the case last night when I was, no joke, dreaming about my ultimate fudgy paleo vegan brownies ???? ). 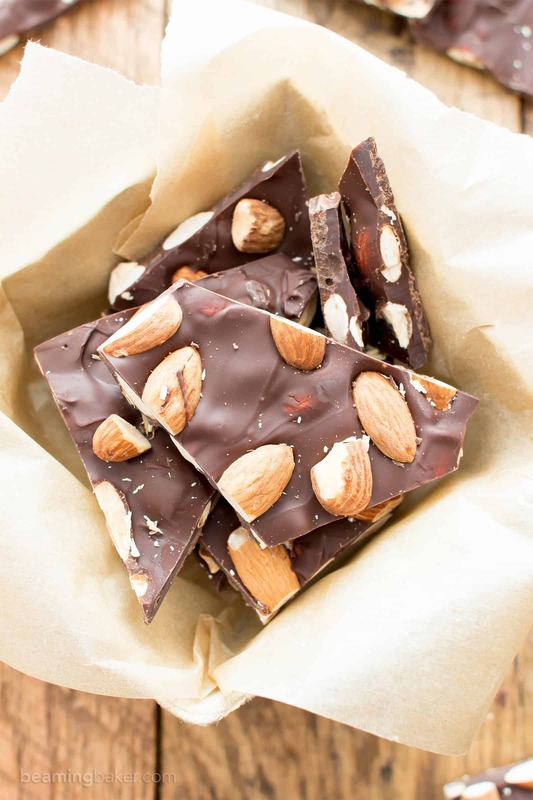 I had the immense pleasure of making this 3 ingredient chocolate almond bark recipe just two shakes of a lamb’s tail ago. And—well, come on, wasn’t that THE cutest expression ever?? What was I saying? Right! 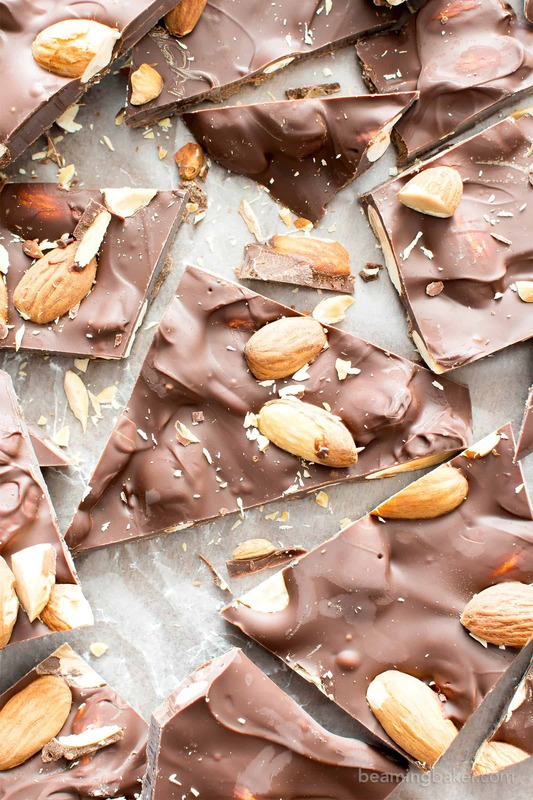 This 3 ingredient chocolate almond bark recipe has me in the best mood ever. Tell me, are you a fan of almonds in chocolate, or just nuts in general, in chocolate? Some folks are seriously against it, others love the nuttiness that balances out the richness and sweetness of chocolate. 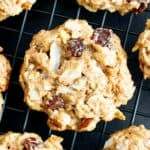 Erik, for example, claims he doesn’t like nuts in his desserts, but will happily consume my homemade KIND coconut almond bars by the dozen. 😉 I personally will take chocolate any which way it comes for me. Even though that sounds mildly threatening. Anyway, I’ve recently been getting into dark chocolate. You might remember me mentioning this in my easy gluten free dark chocolate muffins recipe. Erik and I are currently at the 88% mark. We might try a higher percentage soon, but for now, we’re safely seated at 88%. 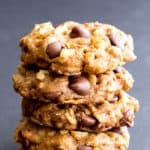 Meanwhile, we’re thinking about using some 88% chocolate in these recipes: 5 Ingredient Dark Chocolate Almond & Coconut Homemade KIND Bars, Easy Gluten Free Peanut Butter Chocolate Chip Oatmeal Cookies, 5 Minute Homemade Fudge. Thoughts? The thing about 88% is that it makes me enjoy the flavor of chocolate so much more. Or, I guess I just appreciate the deepness of the flavors. Whatever that means (I’m feelin’ highfalutin now, y’all!). And now, when I eat a piece with an almond or cacao nib, it’s like, WOAH!! I can taste the actual chocolate more than just enjoying a hit of sugar. Ya know? 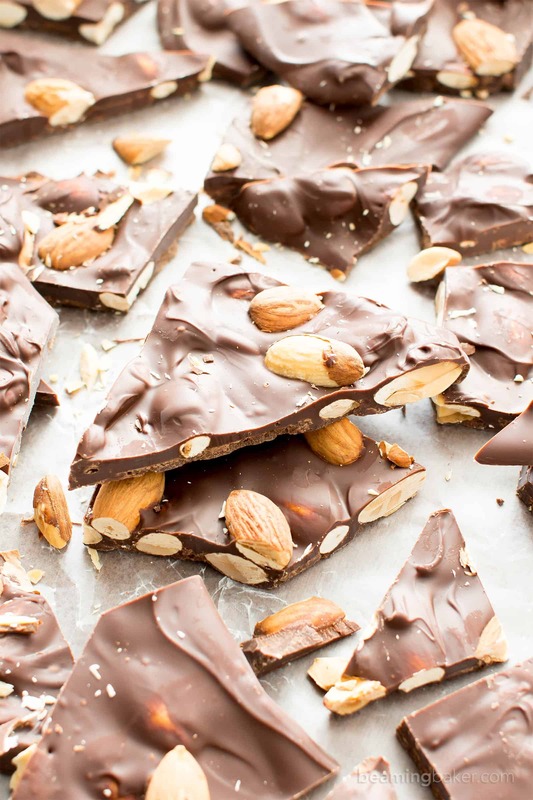 So that’s my whole dissertation on why you need to make this 3 Ingredient Chocolate Almond Bark Recipe. Like right now. Not that you have to make it with dark chocolate or extra dark chocolate or anything you don’t want to do, but that you should just try it! It’s made with just 3 simple ingredients. And the prep time is 5 minutes, or less! The other best part (yes, there must be more than one!!) is that this 3 ingredient chocolate almond bark recipe makes for such a great gift, just like my 3 Ingredient Chocolate Pecan Fudge. It looks so impressive and like you totally worked on it all day, while also earning your degree in professional chocolatierism. What’s your favorite kind of chocolate? 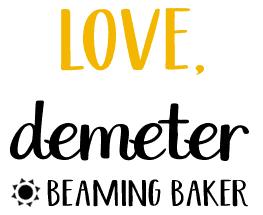 Line a small or medium baking sheet with wax paper or parchment paper. Clear some room in the refrigerator for this sheet. Set aside. To melt the chocolate, use the double boiler method or do the following. Add chocolate and coconut oil to a medium, microwave-safe bowl. Heat in 20-second increments until melted. Stir in between heating increments, until smooth. Fold in almonds. Pour onto prepared baking sheet. Using a rubber spatula, spread into an even layer of desired thickness. 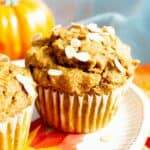 Optionally, sprinkle with more almonds. Refrigerate until firm, about 20 mins. Immediately remove from refrigerator and allow to reach room temperature before cutting (to avoid leaving fingerprints/sweating). Separate chocolate from paper. Break or cut into pieces. Enjoy! Storing instructions below. - Store in an airtight container at room temperature, in the refrigerator or freezer for up to 1 month. 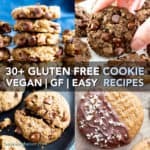 - More chocolate lover recipes: 5 minute homemade fudge, double chocolate oatmeal cookies, vegan gluten free chocolate cupcakes. I’m 100% a nuts and chocolate girl. Honestly, and this feels almost shameful to admit, I don’t really like chocolate without nuts or fruit in it! And the darker the better! I might even sprinkle a few salt flakes over the top! To each her own! 🙂 A few sprinkles of salt would be amazing on this! This stuff looks perfect for my sweet tooth. 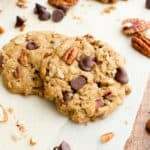 I love the crunch from the almonds! Oh yes! This bark satisfies like no other! Yum! 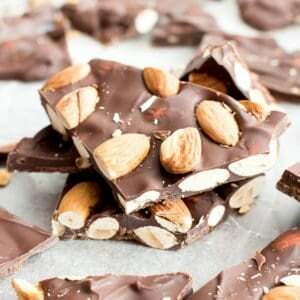 I love the combination of chocolate and almonds. This comes together so easily too! Definitely adding to the list. This sounds perfect and I’m a big fan of dark chocolate. Love that this is only 3 ingredients! Oh this would be perfect for Easter! 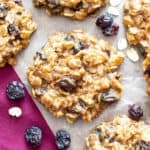 Love easy desserts like this! I love nuts and chocolate together! And I adore dark chocolate. I like it much better than milk chocolate. And it’s probably a good thing that more candy bars are milk chocolate and not dark chocolate or I’d be in big trouble. I love how quick, easy and gorgeous your bark recipe is! 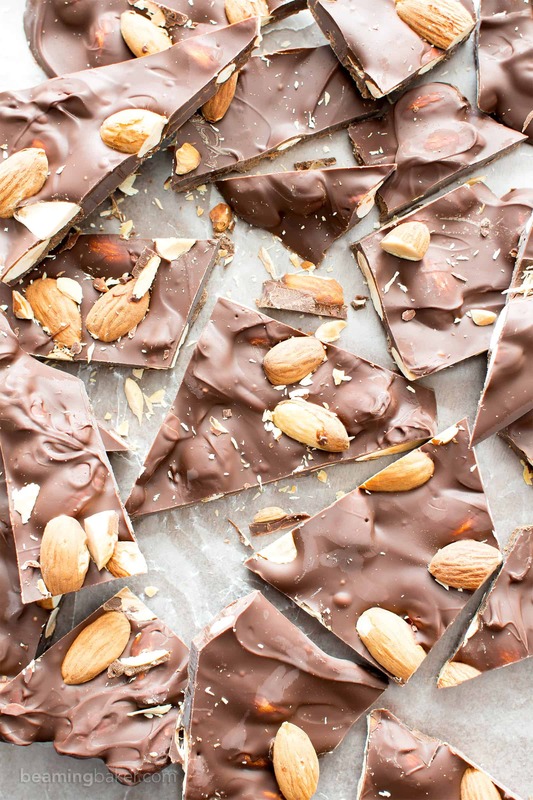 Almond bark reminds me of my best friend and I can’t wait to make your delightful recipe. One of the best snack in my book! 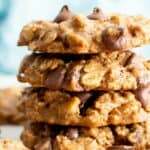 Nuts and chocolate are a winning combination and this is such a wonderfully easy recipe. I think I should always have a batch on hand. I’m going to have to hide this from my kids otherwise it’ll be gone in a flash! I could snack on this all day long! The perfect 3 ingredients! Such a delicious treat! 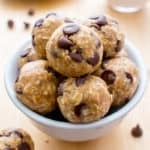 Great for an after school snack! This is such an amazing treat! I can’t wait to give this a try! If I double broil chocolate do I add oil? Can it be any oil? 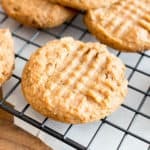 Hi do you know the nutrition facts on this recipe? Hi there! 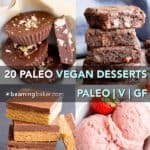 Here are a few brands of paleo chocolate that I’ve used. Hope you enjoy! Hu Dark Chocolate Bars or Enjoy Life Chocolate Chips.